I drove the new Golf GTD from Wolfsburg to Berlin on the Autobahn and some mountain roads. What I've learned is that, although the U.S. isn't getting it for a while, it's a car worth waiting for. It's the new generation of the Golf, so you know half the story even before getting a glimpse of it. But when you do, you probably approve as this seventh Golf looks pretty sharp. And when it comes to the GTD version, from the outside, only the missing red stripe from the grill tells you that it's not a GTI. Just like on the inside, where the grey tartan seats remind you of the TDI up front. That's because the GTD is essentially a GTI with lots of torque instead of rev-happy horsepower and much better fuel economy. Volkswagen's hinted it could get better than 40 MPG highway with the DSG gearbox in a car that reaches 62 mph in 7.5 seconds and keeps going until 143 mph effortlessly. Sounds like your ideal hot hatch? The top speed is actually quite interesting even if it only effects the Germans and the residents of the Isle of Man. You floor the GTD and it will reach 143 mph in no time. It remains pretty quiet too. You also feel that it could do more, and when looking at the tachometer, there's at least another 1,500 revs to go until redline. I believe the only reason for it to stop there is the GTI's top speed of 152 mph. The diesel is not allowed to match the star of the lineup. Still, if you choose the manual gearbox, the GTD rewards you with an extra mile per hour. Slowing down from Autobahn speeds, the brakes were good and very progressive, the ride is nice and since the GTD uses the GTI's chassis, it's rigid and you can throw it around the corners very accurately. The steering also gives enough feedback despite being electric rather than hydraulic, so if you push it hard, the GTD delivers. Having said that, I was using the car mostly in normal mode out of the five settings offered by the touchscreen. The sport mode certainly sharpens things up a bit, but it also keeps the TDI revving higher which is still not something you want to listen to but will thanks to the (optional) sound actuator system. It's also pointless since the maximum torque of 280 lb.ft. is available from 1,750 to 3,250 rpm, meaning that if you want to overtake somebody, you can, no matter what the actual settings are. It's really all about the torque with this two-litre engine. There are 184 horses under the hood, but the torque dominates the scene. 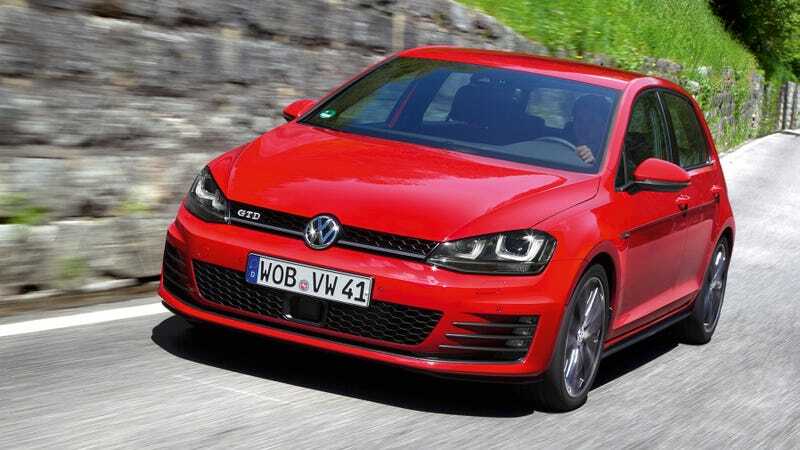 And in the corners, you better be careful with that since the GTD is not getting the clever electronic front axle transverse differential lock that comes with the GTI's performance package option. Bad point for VW there. It's difficult to criticize modern cars because they ride well, have good brakes and give you plenty of power for not that much fuel. The sporty diesel version of the seventh Golf is no exception, and when it comes to the cabin, we're talking about Audi quality. It's a nice place to be in, and thanks to the new MQB construction, much more spacious too. There are two SD slots in the glove box for your entertainment, a sporty steering wheel in front of you and an informative touchscreen in the middle. The only thing that didn't work well was the satellite navigation, which looks great and does its job brilliantly if you pre-program it, but is impossible to zoom in or out of in case your plans have changed. This fool couldn't figure out how to make it work properly, which means it's not foolproof enough. A surprising error. I'm not really a Golf person, but at the end of the drive, I had to admit that the GTD is a very clever allrounder. I loved the tartan seats, the fact that the trip computer's numbers are animated to remind you of flipping clocks (little details like this sell cars), the build quality and the whole concept of going fast while using a lot less fuel. It's certainly not as exciting as a GTI, but just as quick in real life while making much more sense as a daily driver. Is it a good compromise? See for yourself America in 2015.